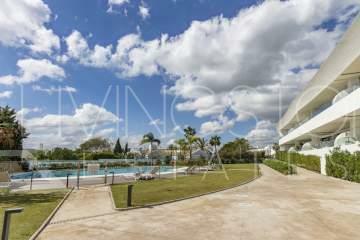 Splendid luxury middle floor apartment with 2 bed/2 bath in one of the best urbanisations on the New Golden Mile with fantastic garden and sea-views from the terrace. Accommodation comprises an entrance hall, fully fitted kitchen with Siemens appliances as well as aircondition hot/cold, under-floor heating and alarm-system., 2 double bedrooms, the master with ensuite bathroom also includes a laundry patio and a spacious lounge-dining room with access to the terrace and panoramic sea views. The Master bedroom with en-suite bathroom includes a Jacuzzi bath. The communal area gives access to gym and sauna and the 24 hours security with video surveillance ensures your safety at any time. 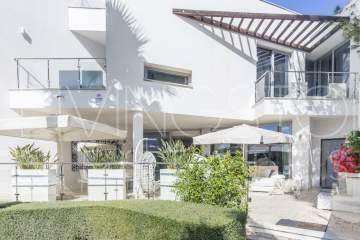 Short walk to restaurants and amenities and 10 minutes driving from Puerto banus.